IMAX Corporation along with TriStar Pictures and Media Rights Capital recently announced that “Elysium,” filmmaker Neill Blomkamp's (“District 9”) futuristic action film starring Matt Damon and Jodie Foster, will be digitally re-mastered into the immersive IMAX® format and released in IMAX® theatres worldwide. 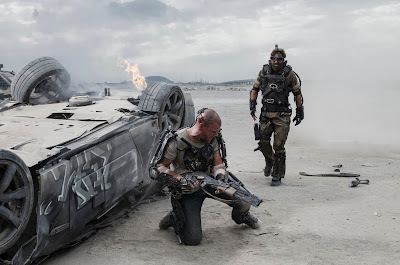 In the Philippines, “Elysium” opens in IMAX theaters on Sept. 04, simultaneous with 2D and regular cinemas nationwide. "Neill Blomkamp is the kind of innovative, creative storyteller that moviegoers seek out, and we are thrilled to bring this highly anticipated film to IMAX audiences worldwide," said Greg Foster, CEO of IMAX Entertainment and Senior Executive Vice President IMAX Corp.
"`Elysium' is one of the most highly anticipated films of the summer, so we're pleased that audiences will have the chance to see Neill Blomkamp's vision for the future in IMAX's immersive format," said Rory Bruer, president, Worldwide Distribution for Sony Pictures. The IMAX release of Elysium will be digitally re-mastered into the image and sound quality of The IMAX Experience® with proprietary IMAX DMR® (Digital Re-mastering) technology. The crystal-clear images, coupled with IMAX's customized theatre geometry and powerful digital audio, create a unique environment that will make audiences feel as if they are in the movie. In the year 2154, two classes of people exist: the very wealthy, who live on a pristine man-made space station called Elysium, and the rest, who live on an overpopulated, ruined planet. The people of Earth are desperate to escape the crime and poverty that is now rampant throughout the land. The only man with the chance to bring equality to these worlds is Max (Matt Damon), an ordinary guy in desperate need to get to Elysium. With his life hanging in the balance, he reluctantly takes on a dangerous mission – one that pits him against Elysium's Secretary Delacourt (Jodie Foster) and her hard-line forces – but if he succeeds, he could save not only his own life, but millions of people on Earth as well. Written and directed by Neill Blomkamp. The QED International / Alphacore Studios / Kinberg Genre production is produced by Bill Block, Neill Blomkamp, and Simon Kinberg. “Elysium” is distributed in the Philippines by Columbia Pictures, local office of Sony Pictures Releasing International.